Royals fans, you’re team has a 12 1/2 game lead in the AL Central, and a 6 1/2 game lead for best record in the American League. While plenty of games remain, you can probably start putting together your ticket plans for the playoffs. Major League Baseball released its postgame schedule, Tuesday, and tickets are already getting purchased fast. kansascity.com has highlighted the dates of importance for the divisional series and beyond. As it sits, Kansas City would have home-field advantage over the wild card winner, which is either Baltimore or Toronto. With its recent history and big-time moves at the trade deadline, baseball would like to see the Royals and Blue Jays face off against one another for the chance to move on to the AL championship series. Both teams feature rosters littered with all-stars, and with the addition of Troy Tulowitzski, the Jays have become one of the more explosive offensive teams in baseball. Toronto and the New York Yankees are in a slugfest for first place in the American League East, which means there is the chance that an old rivalry dating back to the 70’s and 80’s between the Yankees and Royals, could find its way back to postseason baseball. The first game of the AL Divisional series is scheduled for Thursday, October 8, and is a best of 5 series. If necessary, game 4 would be played on October 12. The American League Championship series is scheduled to begin Friday, October 16. For a full look at both the AL and NL postseason schedule, visit MLB.com. With the schedule available and Kauffman Stadium guaranteed to be packed with fans ready to cheer on the Royals, visit Tickets For Less, today, to find the best seats in the house and secure your spot inside the top home field advantage in baseball. Ticket For Less has ZERO hidden service fees, and when it comes to playoffs, you have no risk in purchasing tickets, and games not played are 100% fully refundable. The postseason is almost here. 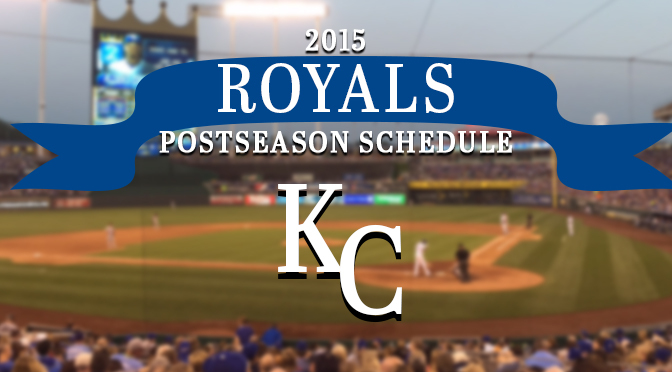 Don’t miss your chance to see your Kansas City Royals make history!